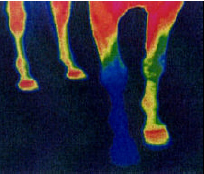 In the picture below you see a thermograph photo of a horse, which shows blood flow, heat and circulation of the legs and hooves. YOU guess what foot has a shoe and which three do not have shoes? The photo is linked to a web page with the following quote: "The single most convincing thing for me was to see a thermograph of a horse's feet--three of which were without shoes and one which was shod. Note the shod foot has virtually no blood circulation. I will NEVER put shoes on my horse again." NOTE: In 1983, Luca Bein, did a dissertation on the shock absorption of a barefoot hoof compared to a shod hoof. His finding were that a conventionally shod hoof loses 60 to 80% of the hoof's natural shock absorption. Bein also demonstrated that a shod hoof on asphalt, at a walk, receives THREE TIMES (3X) the impact force as as a barefoot hoof on asphalt at the trot. Bein found a shoe on a hoof vibrates at about 800 Hertz (Hz), which at that level does damage to living tissue. Think about that, a metal shoe that is nailed into a healthy hoof compromises the hoof wall, triples the impact force of every step, prevents blood flow, damages living tissue, prevents expansion of the hoof, restricts the natural flexing of the hoof, prevents normal growth of the hoof and yet people still put shoes on horses. REMEMBER: You can trot your horse barefoot on pavement and do three times LESS damage than walking your shod horse on pavement. Shoes increase the impact of every step a horse takes, that causes more pounding to legs, joints and tendons. If you do not believe this put a metal plate in YOUR shoe and then go jog on hard pavement and rocks, then you will get it. Shoes prevents the hoof from doing naturally flexing, that prevents good blood flow. Shoes do not allow the hoof to grow, so when the hoof grows with shoe it rips the nails, it puts stress on the hoof and creates pain and damage to the hoof. Metal shoes give more protection to the hoof when a rider is lazy and just wants to run the horse over any terrain, rocks, hard surface and is too lazy to pay attention when they ride. Therefore, when people ask, why do older experienced horse people still use shoes, read the above again. Nails to hold shoes on, puncture the hoof wall and allow bacteria to get in the hoof and cause abscesses, nails get ripped out if the shoe gets hung up on things and destroys more of the hoof when they are ripped out with the head still on. Why do people only shoe the front feet or only the rear feet: Since a horse carries 70% of it's weight on the front legs the front hooves tend to get more issues, lameness or abscesses. Putting shoes only on the rear feet only could be for helping a horse slide more when they stop, since some thinks it is cool or gets more points at shows. It is easier and a short cut to make your horse wear shoes just so you can ride him over rocks thinking it will not hurt them. Actually, since shoes weaken the hoof, walking a horse over rocks and hard surfaces causes more injuries than if the horse had a strong healthy, unshod hoof that would be stronger and heal better.